You know all of those fancy, color-coordinated, beautifully table-scaped dessert displays you see on blogs and all over Pinterest? The ones that make it obvious they had an entire team of people with a slew of professional equipment and (conveniently) an entire collection of coordinating themed dishes and table linens to pull it off? The ones you confidently attempt to replicate and an hour before showtime find yourself hiding in a dark corner drowning your failure in a package of double-stuff Oreos and smashed cake pops that look like a 4 year old made them? I know you know. 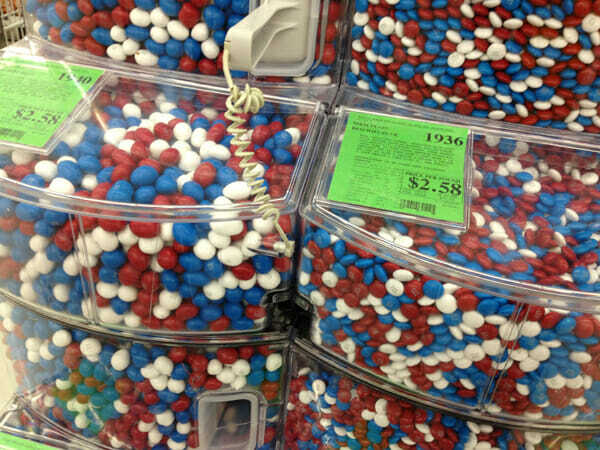 You can even find patriotic mixes this time of year in stores that sell bulk candy. I snapped this picture just yesterday at my local Winco store. Everything in this spread has a super simple short-cut version so it really is simple! And what’s even better, you can make it all ahead of time. 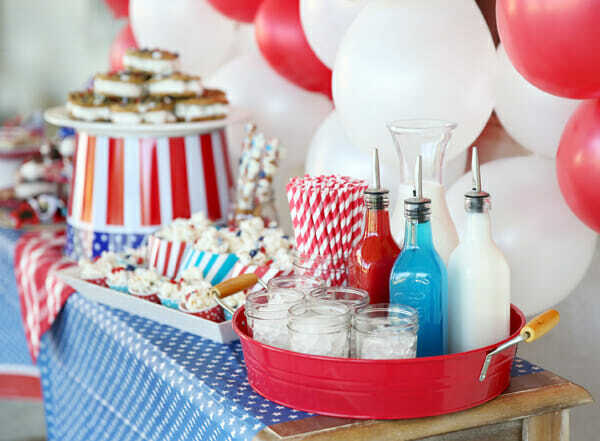 You could make all of these fun things with any color scheme you want, but for our patriotic party, we went with red, white, and blue. First thing: M&M Chocolate Chip Cookie Ice Cream Sandwiches. Oh-my-gosh-yum. Now, you can make your favorite chocolate chip cookie dough and add M&M candies (here’s my favorite) or you can make the shortcut version like we did. Grab a tube of chocolate chip cookie dough from the grocery store and smash some of the M&M’s right on top. I’ve actually discovered it works best to cook the cookies for half of the suggested time, and then pop the M&M’s on there and finish baking. When they’re done and cooled, sandwich them together with softened vanilla ice cream and then for best results re-freeze them before you serve. Soft sweet chocolate-studded cookies with cold vanilla ice cream is one of the best things in life. and sprinkle on the goodies. 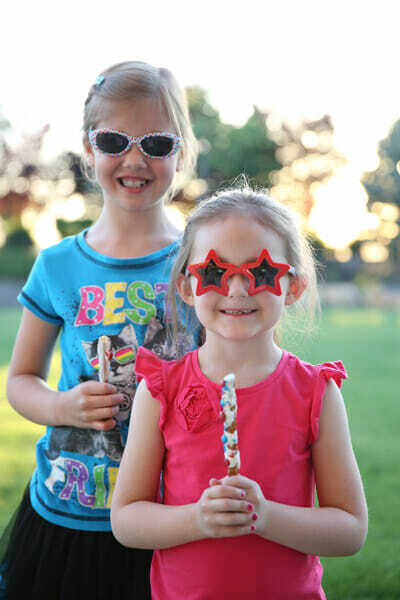 These are always a kid-favorite at parties, and bonus is that they have a salty-sweet combo that adults love too. 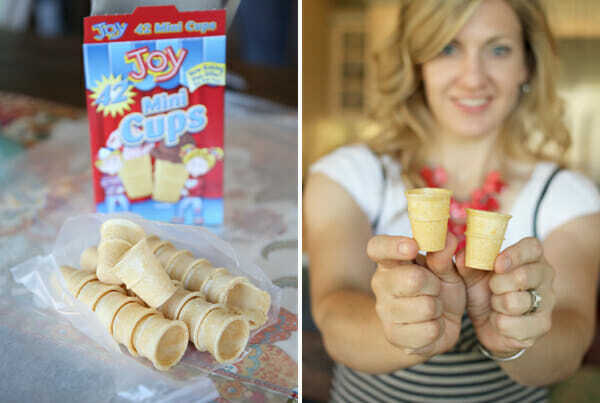 You should have heard my squeals in the middle of the grocery store when I saw that they make mini ice cream cones. These are quite possibly the most adorable things I’ve ever seen in my life, second only to my own offspring. They’re only about an inch and a half tall and perfect for one cookie-scoop of ice cream! I got some help from Kate’s cute daughter, who agreed about the level of adorableness of these cones. Since we already had melted almond bark, we dipped the very top of the cones in it and then added sprinkles and mini M&M’s. These dry fast and can be stored in a container until you’re ready to use them. We also decided that our jobs would be so much easier if we were both working on each photo shoot. We’ve never done a post like this together, and having two people working and two people with cameras was crazy-awesome. Those little mini cones are perfect for mini hands. 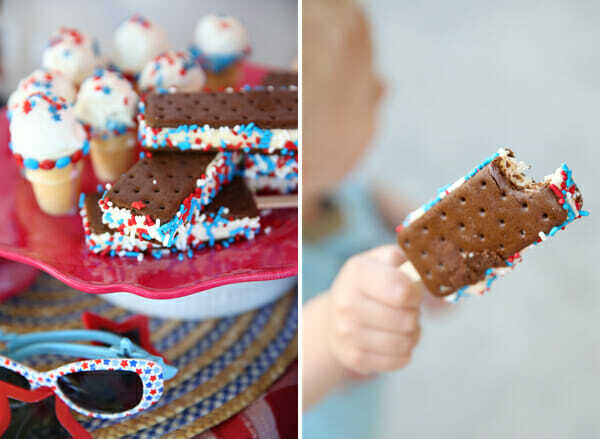 The other thing that’s easy for mini hands are ice cream sandwiches on sticks! 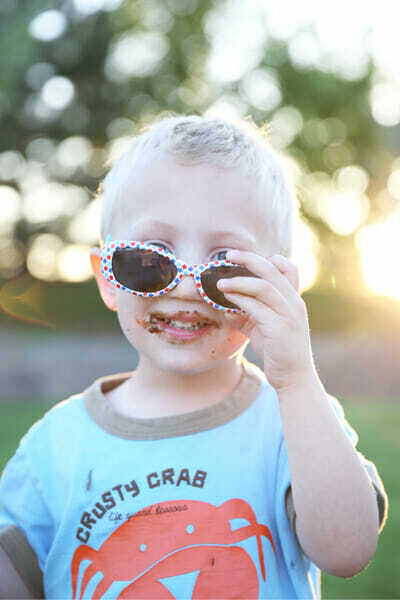 I swear those chocolate cookies are the messiest things on the planet. Buy a box of sandwiches from the store, stick a popsicle stick in them and dunk the sides of the sandwich in sprinkles or M&M’s or both. 5 minutes and done. At least that way the mess stays on the face instead of the hands. Here’s another one of my go-to party desserts: mini trifles. You can make them in any sort of container; little plastic cups are perfect for big groups. The only thing we baked was a .88 cent bag of brownie mix from the store that took about 30 seconds to mix up. 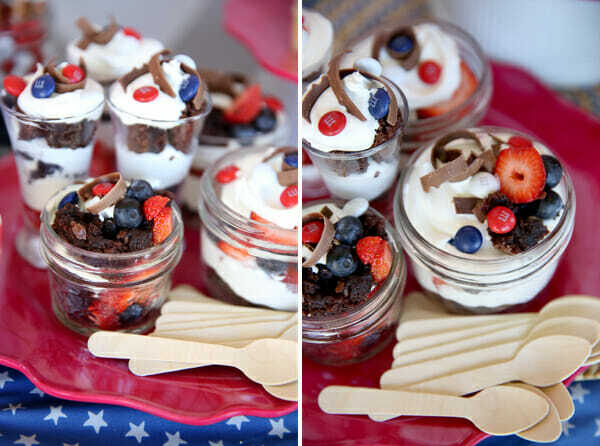 We then layered the cooled brownie chunks, sliced berries, and cool whip (or you could do whipped cream) on top. 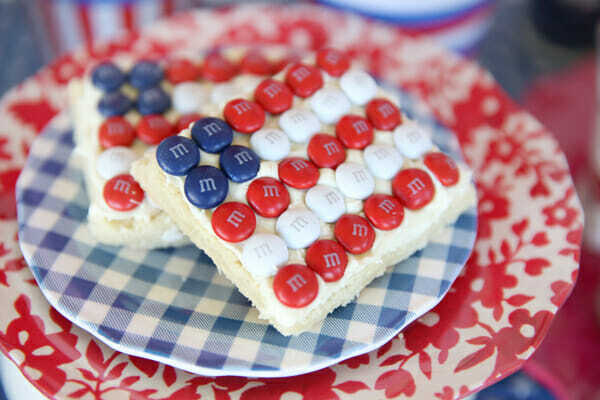 It’s also great with cubed pound cake or angel food cake, but we wanted to stick to choc-0-late to go with our M&M’s! 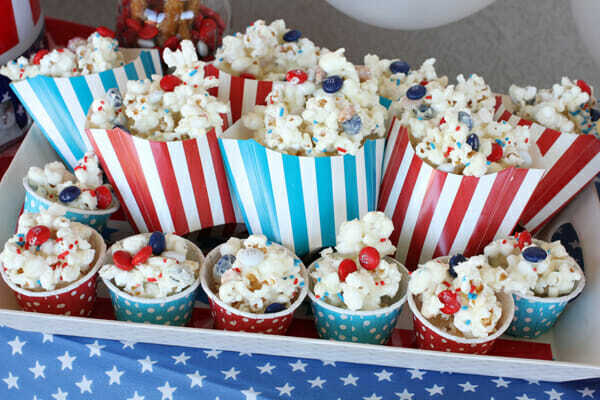 It’s always good to have something that people can munch on in small quantities, and popcorn is always a crowd pleaser. 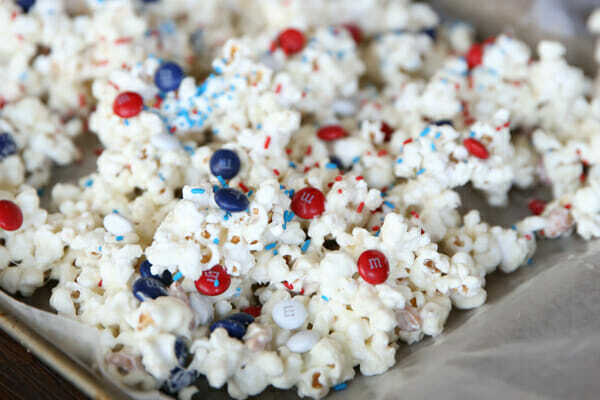 Just coat plain popped popcorn with melted almond bark and then sprinkle with M&M’s and sprinkles. So easy and so yummy. We tossed in a few handfuls of salted peanuts as well. Again, 5 minute project! You can find cute little containers like patterned cups and fry boxes at party stores, and places like Orson Gygi. How cute are these little flag cookies?? Our easy short-cut version: Take a tube of store-bought sugar cookie dough and press it into a foil lined 8×8 pan. When it’s cooled, remove from pan, cut into rectangles and spread a layer of frosting over the top. Recruit some helpers to start making flags! Not a fan of store-bought dough? Just make your own- here’s our favorite recipe. We’ve got tons of great mocktails on this site, check out our beverage section for tons of family-friendly sips, like our Layered Patriotic Punch! 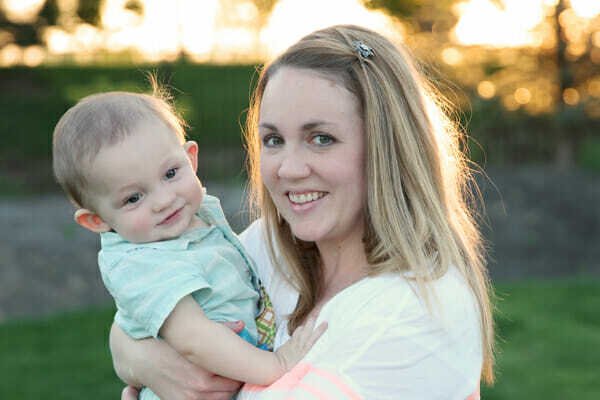 Recently, I introduced my kids to Italian Sodas, and found out my husband had never had one before either. Wha…??? It rocked their worlds and they’ve been asking for them ever since. Kate had a similar experience recently as well, so we went with a red, white and blue Italian (yes, the irony isn’t lost on us) soda bar. 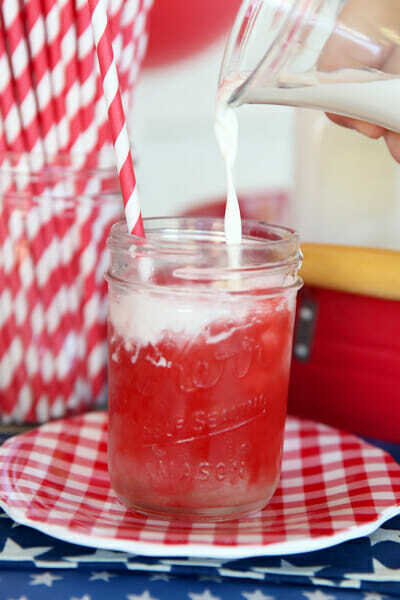 If you’ve never had an Italian Soda either, check out this fun how-to graphic from Orson Gygi. Stores like World Market have a great selection of flavored syrups. Coconut syrup is great for your “white,” or we actually used Pina Colada mix! The Target dollar section is my best friend when it comes to no-fuss get togethers. 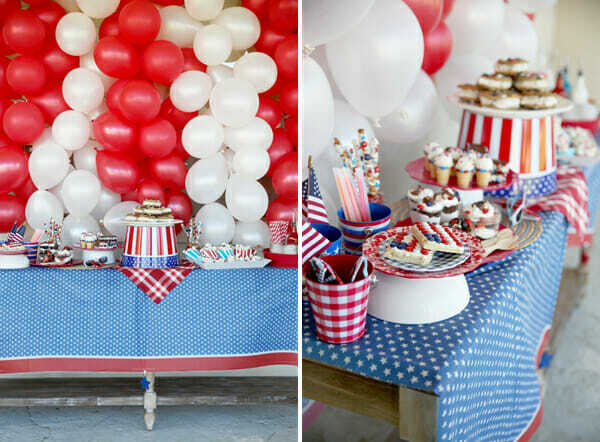 I grabbed cute tablecloths there, some festive plastic plates, and some favors for the kiddos. 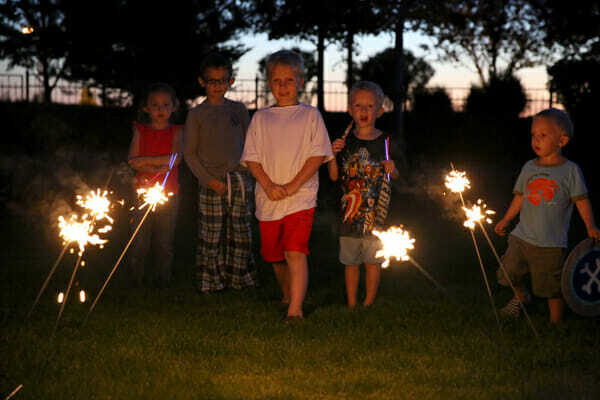 and when the sun went down, we busted out the sparklers. 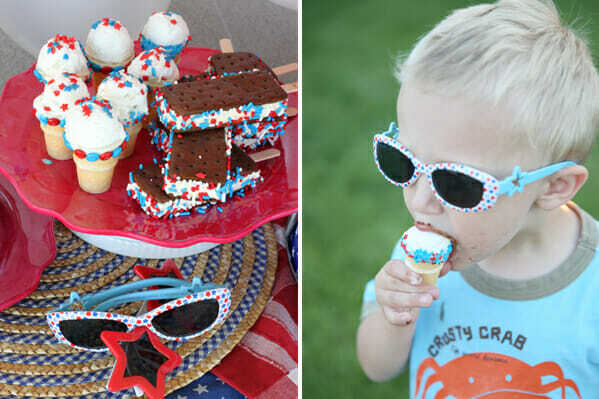 Because what’s a patriotic party without a little sparkle? When our friends took off, we had little goodies to send them on their way. These darling tags are free for you to download! (See end of post.) Fill up little bags of M&M’s for a festive treat. You can fold them over little cellophane baggies, or use some cute washi tape to stick them to just about anything. They were custom designed for us by West & Main Design, check out her cute Etsy shop, we love it! Now you’re all set to create one killer party, and no one has to know about all of the short cuts! Grab some M&M’s and a few store-bought goodies and you will surely be the best host on the block! 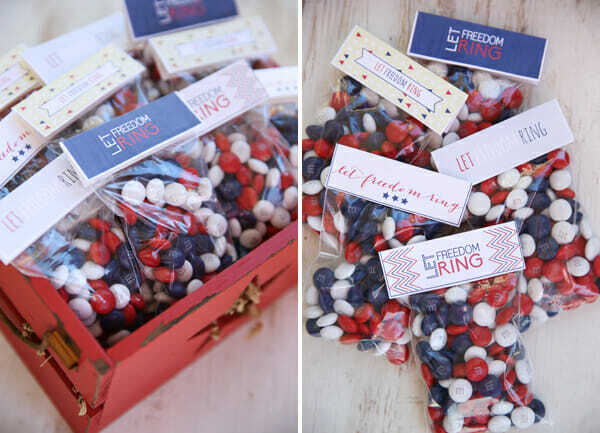 Click Here to Download the Free “Let Freedom Ring” Printables! 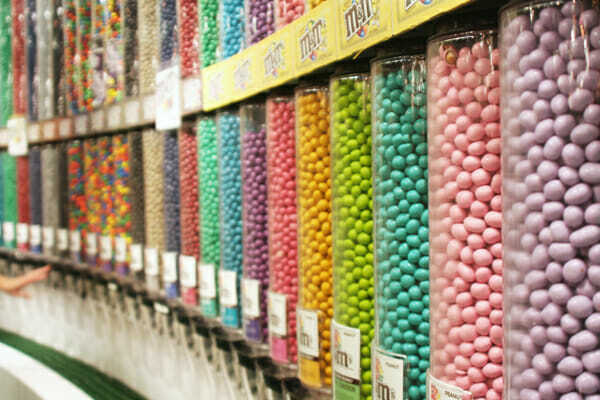 This post is sponsored in partnership with M&M’s. All content and creative ideas are original to Our Best Bites. iOS App Users: Click Here to read the full content of this post! Shopping Notes: Most of the cute paper products you see in this post, like the paper straws, fun sprinkles, and paper containers are from Orson Gygi. Click here to shop online! This looks so awesome! 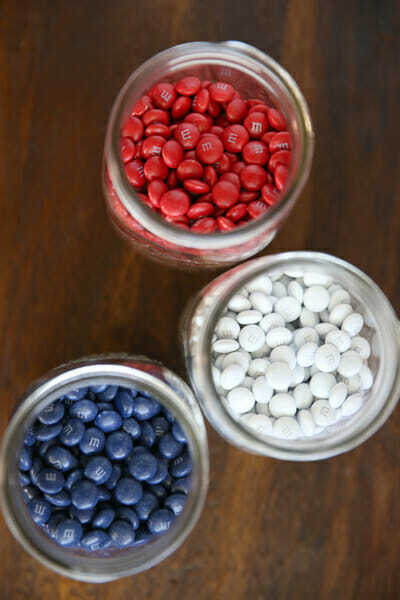 M&Ms rock! Definitely missed your Monday post, but glad to see you are back! Your site is amazing! My wife fixed the Alfredo sauce last night for dinner and it was amazing! Keep up the great work! I love this! I love how easy it is to have an awesome presentation! No worries though. My mom aspires to (have me) recreate everything y’all do anyway. Last year our 4th of July was a spread of everything you guys have posted that was red, white, and blue. Let’s just hope she wants to copy this because it looks absolutely delightful. I love it. It looks great! As always, thanks for all of your great ideas an tips! O.M.Gosh! I am dying at how amazing everything looks. 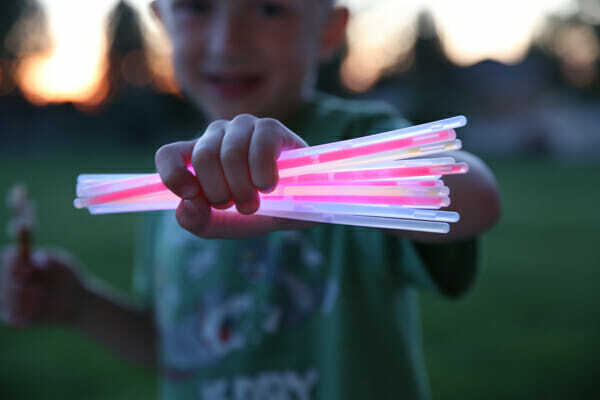 Now I want to throw a party! 🙂 Ice cream sandwiches on Popsicle sticks? Brilliant! Where would one find Popsicle sticks? Are they sold at Walmart and Target? Ok…so I need the recipe for Italian Sodas! I’ve never had one either! They sound delish and perfect for summer! I’m thinking I need to do a post on this! I just added a link to a fun graphic that will help. Basically, it’s sparkling soda, ice cubes, and flavored syrup, and then you add cream or half and half and top with whipped cream! Order one at your favorite coffee shop and you’ll be hooked 😉 I’ll do a recipe post some time on them! I LOVE all the Pick Your Plum stuff I see!!! So cute!! I organize a veterans day assembly at our elementary school every year and after the assembly we have a reception for all the veterans that come. 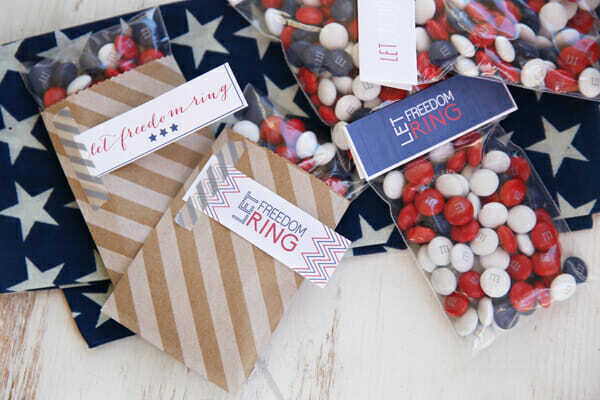 These ideas will be a great way to add something new for the reception and the M&M bags will make a perfect thank you gift for all the volunteers that help. 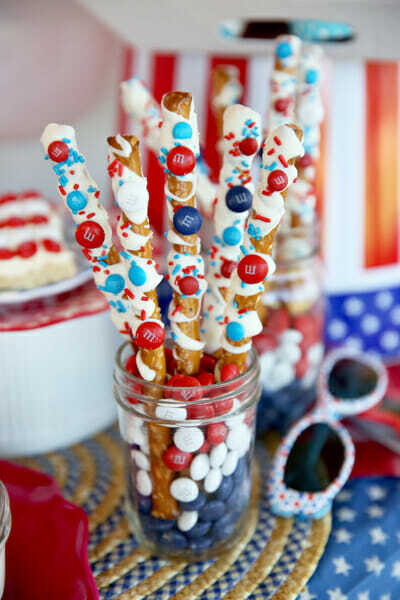 (I might also use the printables with ring pops for 4th of july, but don’t tell anyone I said that because I know this post is all about m&m’s). Ooh! I can also use the same ideas for my son’s Eagle Court of Honor. Thanks for an awesome post! Haha, you can use the printables on anything- aren’t they so cute?! I love Italian Sodas! What brand is the syrup? We don’t have a World Market around here like you mentioned in your post. I would love to make them for my family too! I want to come hang out with you two for a day! You need to do a “Hang out baking & partying with Sara & Kate for a day” giveaway… just make sure I win, okay?! Not a bad idea! The flavored syrups are the same types used at coffee shops, brands like Torani. You can find basic flavors at grocery stores, and the more “fun” ones at specialty stores, or online. Oh my gosh, thank you for this post! 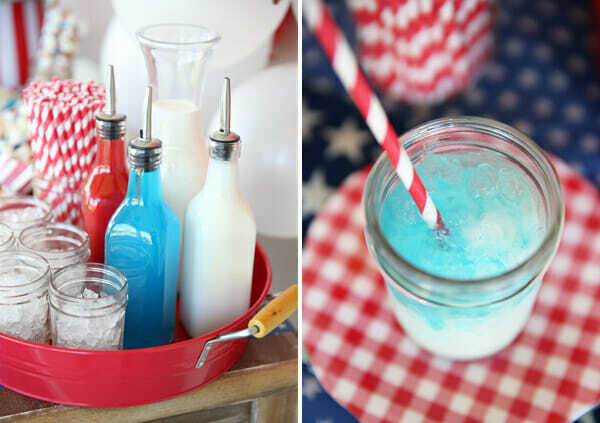 I am hosting a 4th of July get together and had no idea how to make it cute and thematic and still easy. Love your ideas!! The Fourth is my favorite holiday to celebrate! (Probably because my birthday is the second :)) this is awesome, I will be replicating (some) of it! 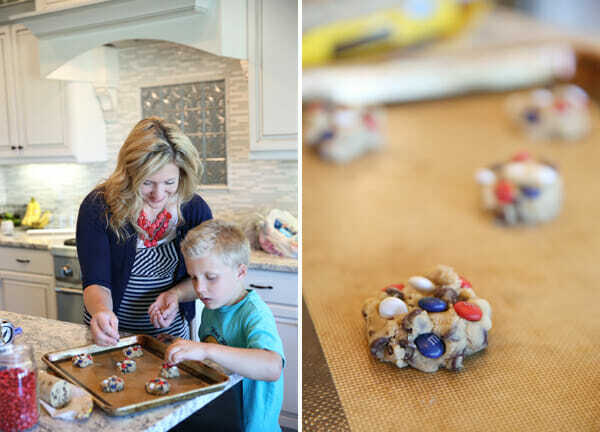 I absolutely LOVE your idea for easy flag cookies! 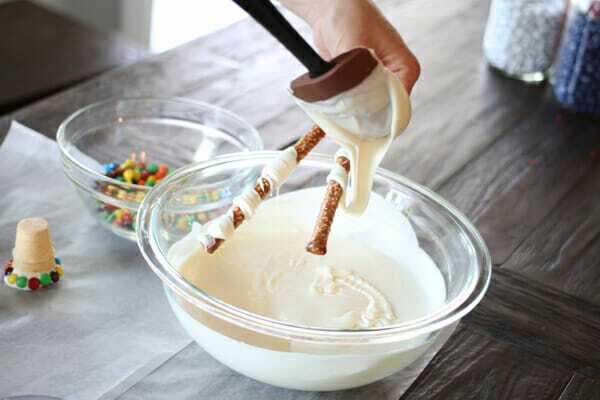 I never would’ve though to use M&Ms to do that, but my daughter & I are totally making those this year. Fun! Thanks for such a great post! I too bouhgt the mini cones, but No tool or scopper I can find, ( melon baller or small ice scream scoop will fill them easily) I am think soft serve on them would work as the pening is so narrow- other inventive ideas? I broke 2 mini cookie scoops that had the metal swivel lift! 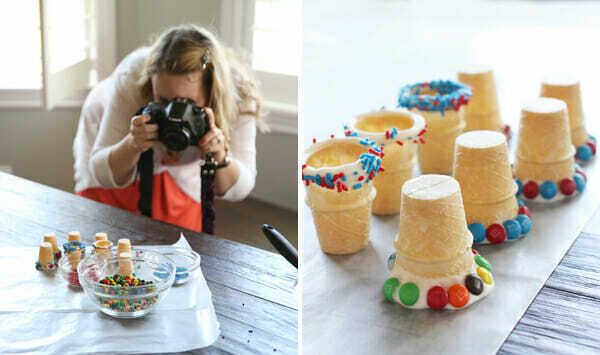 I used those mini cones to bake cupcakes for my daughters ice cream party when she turned 4. Perfect for little hands and bellies without the mess of ice cream. Plus they were so darn cute! I love all of these ideas (and so will my kids!) Thank you! I want to know who you suckered into blowing up all those balloons behind the table! Great ideas! Oh my gosh Monica, lol. I need to go add a whole novel about the balloons to this post! It’s a perfect example of the problem in the first paragraph when bloggers give you ideas that turn out to be nightmares, haha. Why did we listen to those craft bloggers that said balloon backdrops were totally awesome and super easy?? It was a crazy headache, and our sweet friend Laura blew up almost ALL of them! I will have to show you a behind-the-scenes of that part, haha. Super cute!!! That is awesome you both were able to get your families together for a fun visit! oh my gosh you are hilarious. You DO know. My girls have birthdays a month apart, so a month before birthday season, I head to Oriental Trading Company and order a couple party packs. They come with themed plates, cups, napkins, and matching balloons, streamers, table cloth, invitations… and probably other stuff I can’t remember. Lots of cute ideas. 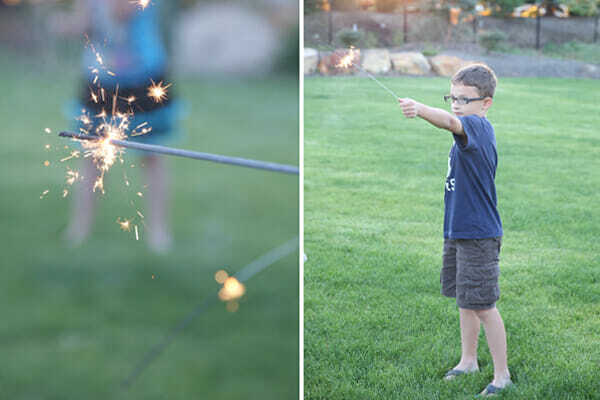 The sparklers are out though. Can you believe they’re illegal in my state? So many cute and fun ideas!! Loved this post! 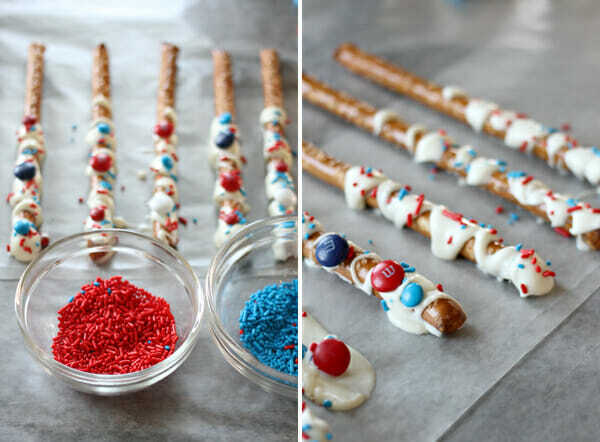 What great 4th of july ideas! Thanks for sharing. All my kids and nieces want to come to your party! Yum! Wow…I LOVE all of these ideas!!! Pinned!! 🙂 Thanks for posting! I love it! Please tell me where you got the red serving tray that the Italian soda stuff in. I have been looking for something exactly like that. And the cake stands, and plates and…;) you girls are my favorite! Looks fantabulous!!!!! But how did you do the awesome balloon display? Sheryl- DON’T DO IT, haha. The food was easy, but those balloons were such a headache, lol! We tied balloons onto long strings and taped them up to the wall. It looks pretty in the pictures but I will never do it again. Ever. 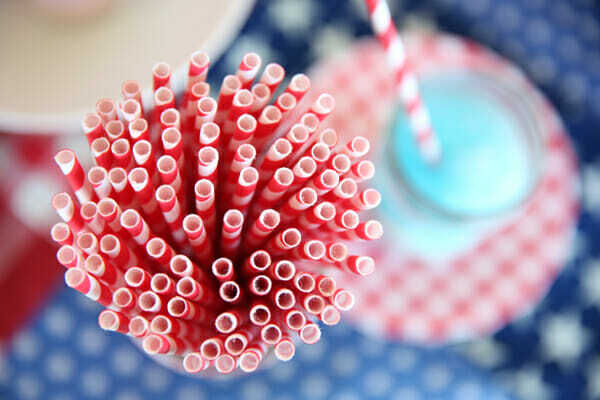 Where did you find those great striped straws? So cute! They’re from Orson Gygi, check out gygi.com for tons of fun stuff! Love, love, love this. So simple and attractive. Love it. Will be doing it!! Thank you!!!! Sylvia I had to buy striped straws through amazon, but I *think* I saw some at Michael’s craft stores. I might be wrong. What are the dimensions of the flag cookie rectangles? I’m planning on making them for a big event. Much easier then decorating a lot of cookies with icing. We used 2 rolls of refrigerated dough in a 9×13 pan and after cutting off the edges to make them straight, we got 8 big ones. Love the mini cones but struggling to find them. Where are those cute little things?! 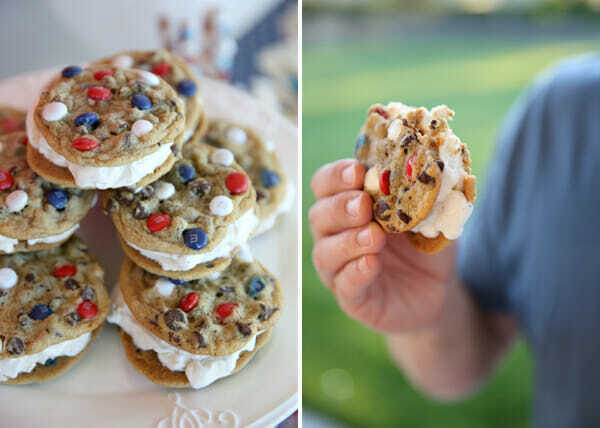 All of these ideas look amazing, but those M&M Chocolate Chip Cookie Ice Cream Sandwiches – oh I wish someone would bring those to my BBQ! 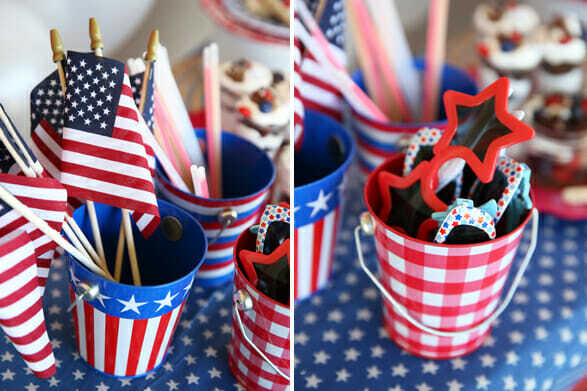 I’ve featured you today on Our Ladies Only Blog Share Red, White & BBQ! Fantastic ideas! Pinning for next year! This is an absolutely beautiful post! Thank you! Hi Sara! I’m throwing a bday party for our cute little Camryn girl (from Kindergarten class?!) and I’ve been searching for the mini ice cream cups. Since we’re local… can you tell me which grocery store you found them in? Thanks! Hey Paula! I got those at Walmart, but I just saw them at Fred Meyer on Chinden and Linder as well! Where are those gingham plates from?